The Bird Cabin, new in 2009, is the perfect retreat for any season. At near 3000 sq ft. it sleeps 12-13 adults in 5 bedrooms and can easily sleep your children on the 4 sofas or the floor. Unlike most Brian Head rentals it hosts a private setting, nestled in the pines, offering the privacy and seclusion you want. This deluxe cabin has been tastefully furnished. The vaulted ceilings, cozy fireplace and log furniture provide the perfect mountain ambiance. A fully equipped kitchen can seat 12 at the large pine table and 4 at the bar. All you need is the food! There is plenty of evening entertainment with an air hockey, large flat-screen HDTV, downstairs theatre, and board games. A banquet table and card table are available for extra gaming or outdoor serving. During the summer enjoy biking, hiking, bon fires at the fire pit or bring ATVs (rentals nearby) to explore Brian Head’s mountain trails. Cedar City’s Shakespeare Festival, only a 35 minute drive, makes this a perfect anniversary “get-a-way.” Base here to visit our famed Utah parks (Cedar Breaks 3 miles, Bryce Canyon 63 miles, Zion’s national Forest 57 miles). 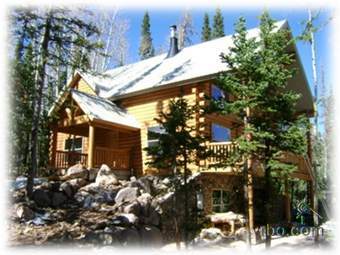 Included with this cabin rental are two free Freedom ski passes at the slopes just 5 minutes away. What a fun place to gather for winter sledding, building snow forts, snowball fights or bring your snowmobiles (rentals nearby), snow shoes or cross country skis. Winter weather requires the use of a 4-wheel drive vehicle. Feel free to call or email with questions, check availability or to make a reservation.